LDN 9999 Lynds Dark Nebula, also known as Barnard 427. Its about the size of the moon at 28'X28'. This is a dark nebula in the shape of a "(>) less than sign" pointing to the right. 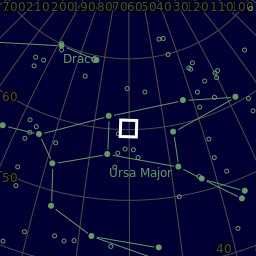 It is just to the left "north" and a bit closer to the upper bright blue star. It is listed as an opacity of 4 on a scale of (1-6=darkest). There are stars visible in the nebula most likely behind it. There are also several small galaxies near the bottom of the ">" including a small blue one PGC 32016 at magnitude 15. Yes I know its obscure but kind of fun!